Dr. Illya “Elliott” Novikov and is originally from the Ukraine where he received his dental degree from the Dnepropetrovsk State Medical Academy in 1996. He then received his Doctor of Dental Surgery degree from the University of Illinois in Chicago in 2001. 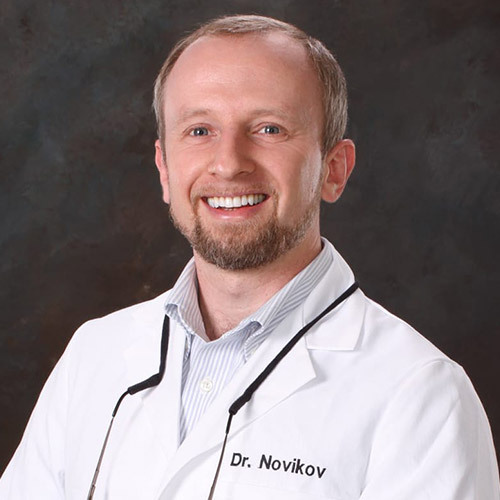 Dr. Novikov has been in private practice since 2002. He is currently a member of the American Dental Association (ADA), the Florida Dental Association (FDA) the Northeast District Dental Association of Florida, the American Academy of Implant Dentistry (AAID), and a fellow of the International Congress of Oral Impantologists (ICOI). In 2005, he finished a one year mini-residency program in implant dentistry at the Medical College of Georgia (MCG). In 2016, he also completed a 12 month dental implant program at Augusta University. This was followed by an IV sedation course at the Department of Oral Maxillofacial Surgery at Augusta University in 2017. To this day, he still constantly improves his professional skills through continuing education courses. Dr. Novikov has been privileged to be involved with charity mission trips to Central America where he helped bring dental care to the indigenous people of the Andes Mountains in Ecuador. His hobbies include martial arts, and cycling.